MAAT is one of 40 shortlisted works competing for the 2017 European Union Prize for Contemporary Architecture – Mies van der Rohe Award, announced by the European Commission and the Fundació Mies van der Rohe. 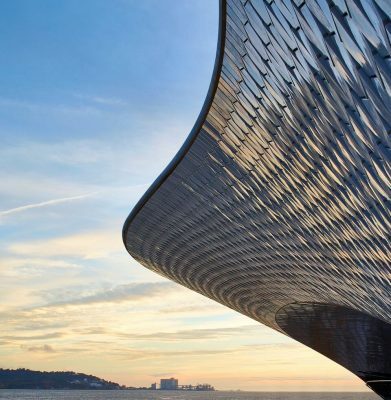 The first phase of a contemporary art kunsthalle designed by AL_A, the architecture practice headed by RIBA Stirling Prize-winning architect Amanda Levete, launched on 5 October in Lisbon with a site-specific installation by French artist Dominique Gonzalez-Foester. 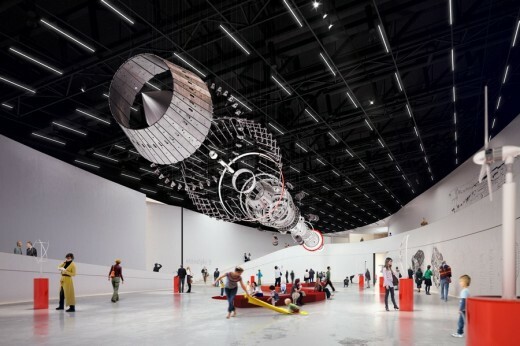 Led by Director Pedro Gadanho and commissioned by the EDP Foundation, the Museum of Art, Architecture and Technology (MAAT) will explore contemporary culture through visual arts, new media, architecture, technology and science. 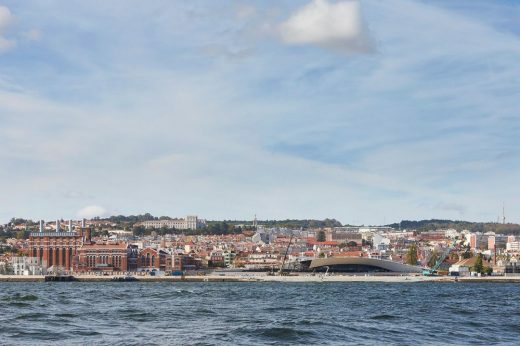 MAAT will be the focal point of the EDP Foundation Campus site on the River Tagus in the district of Belém, at the heart of an exciting urban revitalisation along one of Lisbon’s most historic waterfronts. Housed within two buildings on a 3.8 hectare site, MAAT comprises the elegant new kunsthalle structure and the recently renovated Central Tejo power station. Blending structure into landscape, the kunsthalle is designed to allow visitors to walk over, under as well as through the building. 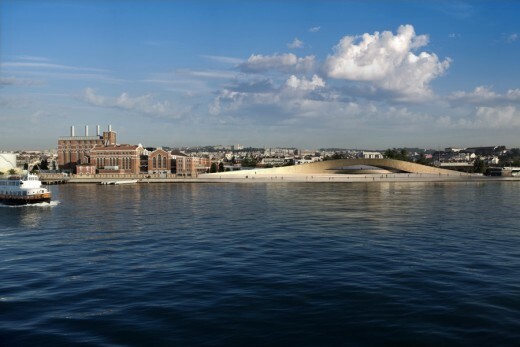 The kunsthalle contains four distinct gallery spaces that sit beneath a gracefully undulating roof, which has been conceived to create significant new public spaces on the roof and along the waterfront. 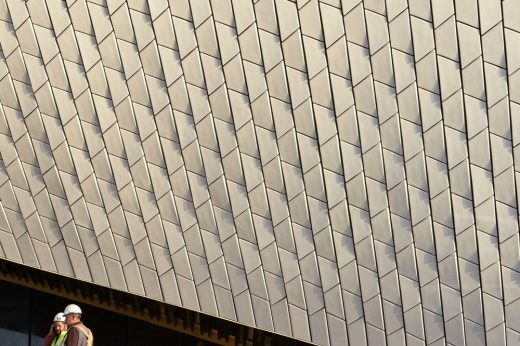 The building’s textured façade is composed of 15,000 three-dimensional crackle-glazed tiles manufactured by Ceràmica Cumella. Building on Lisbon’s rich tradition of craft, the complex surface is a contemporary expression of this characteristic Portuguese building material and continues AL_A’s ongoing research into new uses and reinterpretations of ceramics. The tiles capture the changing light and give mutable readings of the exceptional southern light that vary with the time of day and the seasons. 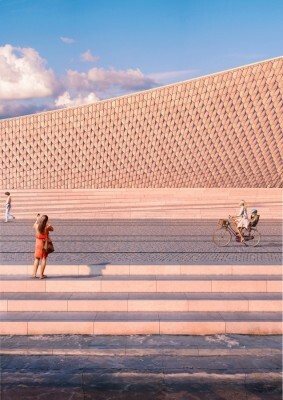 “In understanding EDP’s ambition for Lisbon, our design draws on the context of the site, creating both physical and conceptual connections to the waterfront and back to the heart of the city. The EDP Foundation will officially open the first phase of the kunsthalle to the public on Wednesday 5 October 2016 to coincide with the city-wide Lisbon Architecture Triennale. Pedro Gadahno’s first commission as Director – a site-specific work, Pynchon Park, from renowned French contemporary artist Dominique Gonzalez-Foerster – will inaugurate the Oval Gallery at the heart of the building The opening will be celebrated with a 12-hour programme of events performances and music happenings by international artists in and around the new building. 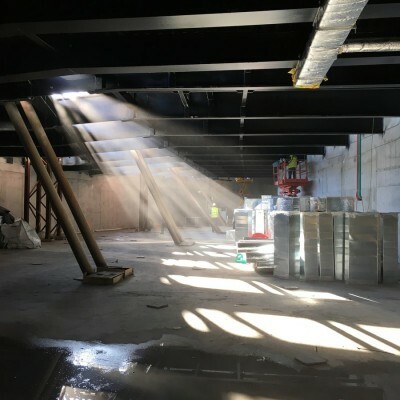 The events anticipate the second phase of the MAAT kunsthalle, set to launch in March next year with the opening of all four galleries, a restaurant and additional public spaces. 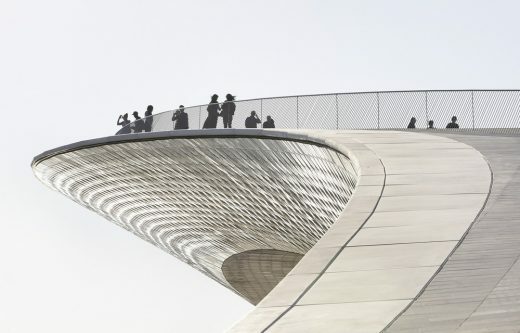 Also in 2017, the park designed by Vladimir Djurovic Landscape Architecture will open, and the campus – and waterfront – will become even more accessible to Belém with the opening of the elegant pedestrian bridge that lands on the kunsthalle roof, also designed by AL_A. Other exhibitions taking place in October across the MAAT site include the The World of Charles and Ray Eames (5 October 2016 – 20 March 2017) and The Form of Form (5 October – 12 December 2016). For the full programme of installations and exhibitions opening in October and beyond across the MAAT site please see below. 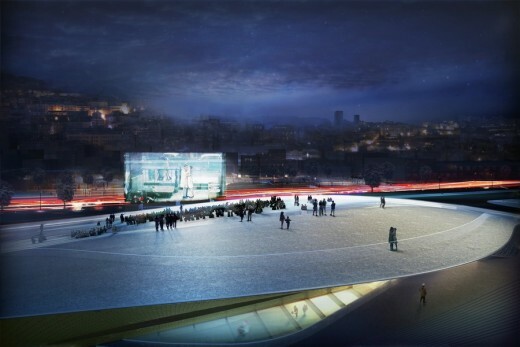 The EDP Foundation today (29 Sep 2016) announced that it will open MAAT, a new Museum of Art, Architecture and Technology for Lisbon, on the 4-5 of October 2016. 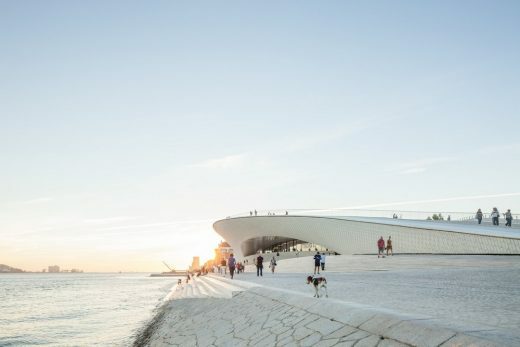 The new museum will become the centrepiece of one of the Portuguese capital’s most popular cultural areas, the historic riverside district of Belém. The announcement was made before 150 invited guests from the world of art and culture at the ARCOmadrid art fair, at a lunch hosted by the Embassy of Portugal in Spain and the newly appointed director of the museum, the Portuguese architect, writer and curator Pedro Gadanho. A new kunsthall building designed by AL_A, the internationally renowned architecture practice headed by Amanda Levete, will open to the public on 4-5 October 2016 with the exhibition UTOPIA/DYSTOPIA, PART 1: Dominique Gonzalez-Foerster. 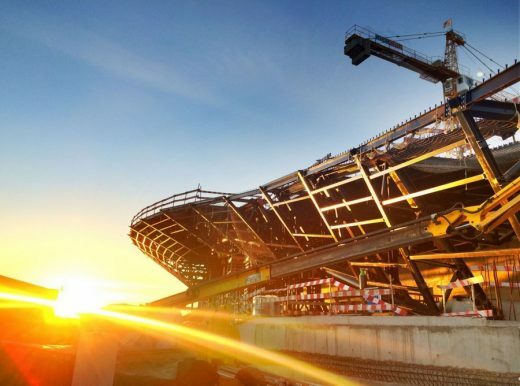 MAAT will focus on contemporary culture through a combination of visual arts and media, architecture and city, technology and science, society and thought. Sitting in a prominent location on the banks of the river Tagus, MAAT will be the centrepiece of EDP Foundation’s 38,000m2 campus. The museum will repurpose an early 20th-century power station building alongside the new kunsthall designed by AL_A. 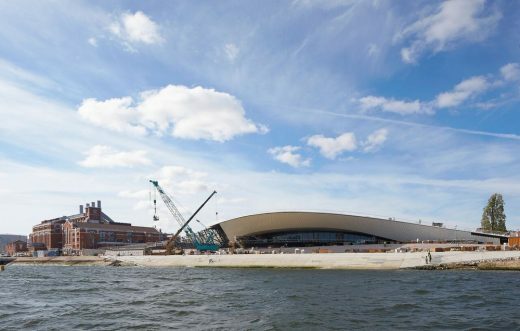 The museum will host permanent science and electricity exhibits in the former power station, with a wide-ranging programme of temporary exhibitions taking place in the kunsthall. 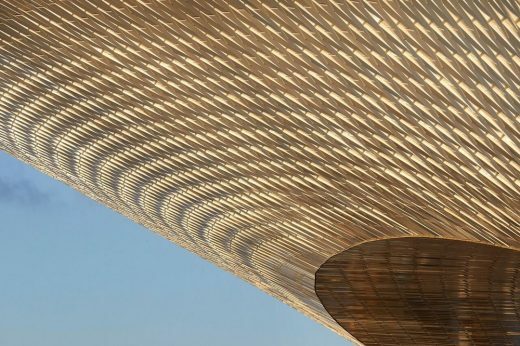 With its unique heritage, an expanding Portuguese art collection, and an innovative exhibition programme, the EDP Foundation’s new museum will be a place for discovery, critical thinking, and international dialogue. The new MAAT kunsthall building, designed by AL_A, will create exhibition spaces beneath a gracefully undulating roof, conceived to create new public space above the galleries. The project will renew access to the Belém waterfront from the city and consolidate the wider publicly-funded urban regeneration of the quarter. Incorporating over 7,000m² of new public space, the kunsthall will explore the convergence of architecture, technology and contemporary art as a field of cultural practice. 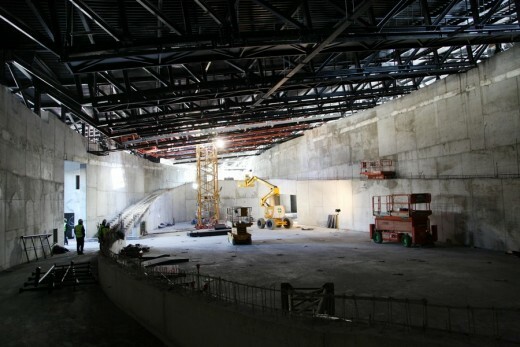 It will accommodate a trans-disciplinary programme of exhibitions, public events and community engagement. As a new discursive space for the city, it will lead the conversation about the evolution of Lisbon and Portugal. AL_A’s response exploits the natural assets of the waterfront site, framing an architectural narrative that is sensitive to both its cultural heritage and the future of the city. 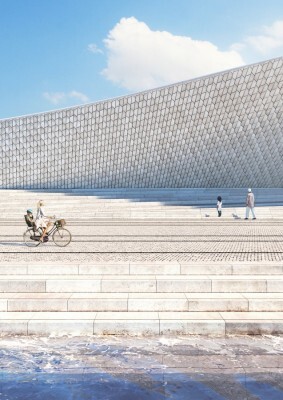 Inspired by Lisbon’s rich material heritage, calçada-tile pavements are subtly reinterpreted underfoot and used to merge the new public spaces with the existing texture of the city street. Building on Portugal’s rich tradition of ceramics, 3D tiles articulate the façade and produce a complex surface that gives readings of water, light and shadow, capturing and magnifying the tonal light qualities of this site. 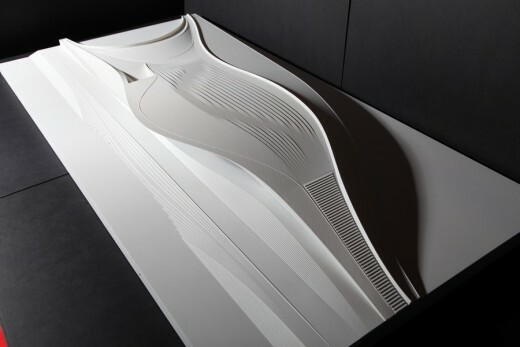 AL_A is the award-winning architecture and design studio founded in 2009 by the RIBA Stirling Prize-winning architect Amanda Levete with Directors Maximiliano Arrocet, Ho-Yin Ng and Alice Dietsch. The practice’s approach to design balances the intuitive with the strategic, drawing on a foundation of rigorous research, innovation, collaboration and painstaking attention to detail. Ongoing commissions around the world include the highly anticipated expansion of the Victoria & Albert Museum in London, due to open in 2017.